Thank you very much for visiting our home page. Our founder, Nagatoro Masaji, in his youth, decided to devote himself to education and so he founded our original school in 1925. Our school motto, “Keiten Aijin” is well known as the expression Saigo Takamori used when he explained the purpose of study. It means that human beings should respect heaven and be kind to and love other people. This is the very beginning of education. We as teachers approach every day with this spirit in mind as we assist in the students’ prosperous growth, paying attention to communicating with each individual. ① We believe in the divine ability and possibility possessed by each student and educate them with a sense of respect and compassion. ② With regards to our curriculum and life guidance, we should put an emphasis on developing each student’s unique and creative talents as well as carry out academic and career counseling to insure that each student attains their various goals for the future. ③ We will adapt with the times and adjust to the social needs of education, and strive to create a distinctive education. ④ As our school is a public educational institution, we strive to develop compassionate students who respect the truth and moral principles, and who can contribute to a peaceful society in order to meet the expectations of that society. mountains and playing and swimming in the river are extremely important. I’m determined to endeavor as much as possible to nurture students to have a rich humanity and a firm sense of mission to cope with the 21st century world. All the while, the teachers and their students respect each other, as Shoin and his students did. We teachers at Chiba Keiai Senior High School, cooperating with the students’ parents, alumni, and people in our neighborhood and following the education concept of the founder, Nagatoro Masaji, will develop and contribute greatly to the future of the students. I sincerely hope that you will understand and kindly support the promotion of education at our school. Became a teacher at Chiba Prefectural Matsudo Senior High School. Transferred to Chiba Prefectural Makuhari Higashi Senior High School. Promoted to director of administration of the high school education division at The Agency of Education of Chiba Prefecture. Promoted to the deputy chief administrator (later, chief administrator) of the Educational Affairs Division at the General Affairs Department of Chiba Prefecture. Started as the assistant director of the Promotion Division for Municipal School Educational Reform at the Agency of Education of Chiba Prefecture. Became the deputy principal, Chiba Municipal Chiba High School. Become the chief administration director, Management Section of Hokuso Education Office, Agency of Education of Chiba Prefecture. Moved to the Safety and Health Division, School Promotion Department, Agency of Education of Chiba Prefecture as the director. Began as the director and head, Promotion Division for Municipal School Educational Reform, Agency of Education of Chiba Prefecture. 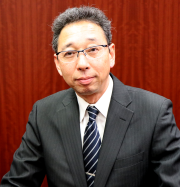 Became the principal, Chiba Prefectural Higashi Katsushika Junior & Senior High School.